Genmaicha: green tea from Sencha blended with roasted brown rice. Very warm, calming effect, and low caffeine green tea. “Genmaicha” in Japanese (玄 米 茶) can be translated as “brown rice” and “tea” and as the name implies is a Japanese Green Tea that is mixed with roasted brown rice. Here brown rice (Genmai) is roasted and popped and classic Sencha or a poorer quality Bancha is added. 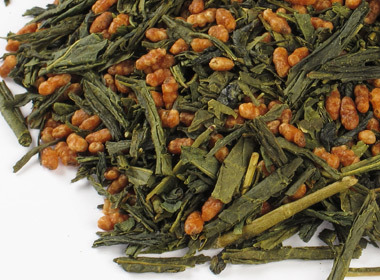 The Genmaicha is recognised for its entirely unique character with a warm malty toasted flavor, reminiscent of toasted grain or fine coffee flavors. The tea is basically works in the same way with the same effects as Sencha Tea with the exception that the addition of roasted brown rice (often 50% share) reduces the content of green tea ingredients. It is therefore highly suitable for caffeine sensitive individuals due to its lower caffeine content and is ideal as an evening tea. The roasted rice acts through the infusion with a body-warming, soothing effect and is better absorbed digestively. For me it is a perfect warming tea for cold winter evenings, or as tea taken after a meal. Some people also enjoying taking the tea during breakfast as its taste and flavor are slightly comparable to a standard coffee. Buyers of Genmaichas should use caution. The malty toasted flavor of the rice allows for the mixing of often inferior, cheap & older coarser Senchas or even bad Banchas as the quality is easier to hide when combined. I therefore recommend to use only very high quality Genmaichas. This price however, even at the best standards are relative to the lowest priced green teas. Lower quality Genmaicha are quickly recognised by their particularly rough, pale and fragile Sencha leaves. Still uncommon but gaining ground are Genmaichas enhanced by additions of Matcha tea powder. The Matcha provides a finer, more vibrant flavor and softens the otherwise very calming effect of the rice. Genmaicha Matcha, in the teacup, can be recognised by it particularly bright glowing green color. Basically the preparation for Genmaicha follows the same principles as for Sencha – traditional infusions as opposed to multiple ones.